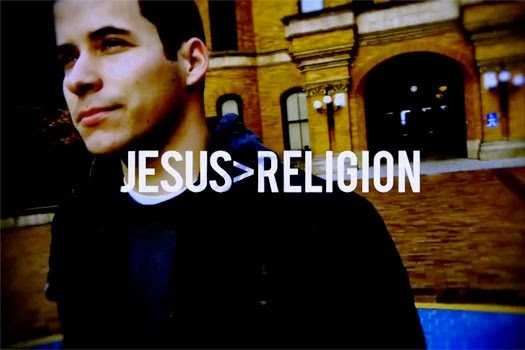 Jefferson Bethke is a young pastor in Seattle, USA. His book, Jesus & Religion, was inspired by his poem that he posted on YouTube entitled "Why I hate religion, but love Jesus," immediately went viral. Why not? If you saw the title, wouldn't you immediately click on the link and watch? Wouldn't you intently listen to every word he says in the controversy-striking poem? I did. "What if I told you, Jesus came to abolish religion? Tend to ridicule Gods people, they did it to John the Baptist,"
That's just the first part of Jeff's really content-filled poem but it is able to send a message that opens up our minds and hearts to a reality that we ignore everyday. That's why a lot of people have an endless search for the perfect church because there is no perfect church. Not everything the church does or says is Biblical! Some churches lure people to engage in business with them--they sell products for personal gain. Some churches say they follow Jesus but don't acknowledge His deity. Some churches focus more on saints and other persons in the Bible and pray to them! Didn't it say in the Bible that "Jesus is the Way, the Truth and the Life"? That "No one comes to the Father except through Him?" People should stop idolizing their church and start searching for the real Jesus, because He is the one who saves, not the church. The reason why a lot of people don't go to church is because they get ridiculed and condemned. The church leaders try to change people and tell them what to do and what not to do. Jesus is not the source of condemnation, Satan is! Jesus only convicts us of our wrong actions. And only Jesus can change us from the inside out. Most churches depict Jesus as dead on the cross. How can a dead man have an effect on us? That is a good question! He can affect us because the truth is, he isn't dead. He is alive! That is why He can do all these things to us and for us. Don't get me wrong. The church is very important for the spiritual growth of all believers. A non-believer needs to know Jesus through the church or member of the church. But we have to look inside of us and assess ourselves. Who do we look up to? Do we look up to the leaders of the church or Jesus? Are the saints blocking our view of the real hero? Do we listen to every word the preachers say but fail to read God's Word?